The U.S. economy grew by an annualized 2.3 percent in the first quarter, according to preliminary data. This was slightly better than the consensus estimate of around 2 percent, even as real GDP eased from 2.9 percent growth in the fourth quarter data. In addition, this was the strongest first quarter reading in three years. Overall, the latest report found healthy growth in nonresidential fixed investment and service-sector spending, with inventory spending and net exports rebounding in the first quarter after being notable drags in the prior release. At the same time, goods spending and the housing market were sluggish, with durable goods spending pulled lower by weak motor vehicle and parts demand. Real GDP should grow by roughly 3 percent in 2018, which would be the strongest growth rate since 2005. Passage of tax reform and other pro-growth measures should help to stimulate economic activity, allowing us to reach that goal. Along those lines, manufacturers continue to increase capital spending, investment and wages because of tax reform and the changed regulatory environment, and the NAM has highlighted those stories on its “Keeping Our Promise” web page. In my testimony before the Joint Economic Committee earlier this month, I said that tax reform should lead to $55 billion in additional fixed investment in manufacturing this year, with the sector adding at least 100,000 more workers. These data were mostly consistent with that optimism, as business spending was one of the larger bright spots in the first quarter GDP data. On the manufacturing front, new durable goods orders rose for the second straight month, up 2.6 percent in March and extending the 3.5 percent gain in February. New durable goods orders jumped from $248.6 billion in February to $254.9 billion in March, a new all-time high. With that said, much of the increase in both months came from nondefense aircraft and parts orders, which can have large monthly swings. Indeed, new orders for durable goods with transportation equipment excluded were unchanged in March. New durable goods orders have trended strongly higher across the past 12 months, soaring 9.5 percent since March 2017, or 6.7 percent year-over-year with transportation equipment excluded. At the same time, surveys of manufacturing activity provided mixed results last week, while remaining encouraging overall. On the positive side, the IHS Markit Flash U.S. Manufacturing PMI rose to 56.5 in April, the strongest expansion pace since September 2014. New orders, output and exports all rose in April, with demand growth at a three-year high. Yet, raw material prices picked up in April, with input costs expanding at rates not seen since June 2011—a trend seen in other data as well. At the regional level, the Kansas City Federal Reserve Bank reported that manufacturing activity expanded in April at the fastest monthly pace since the survey was created in July 2001, with robust growth in new orders, production and shipments. Employment remained one of the bright spots in the latest survey, with the index still at the all-time high reading notched in the prior release. In contrast, the Richmond Federal Reserve Bank reported that manufacturing activity in its district contracted in April for the first time since September 2016. The composite index for general business assessment dropped from 15 in March to -3 in April, with many of the key measures also weakening in the latest survey. Nonetheless, manufacturers in the region continued to invest in their businesses, which should be interpreted as a sign of confidence moving forward. Along those lines, faster growth in April occurred for employment, wages and capital expenditures. Indeed, the capital spending index reached its highest point since the question was added in December 2010, which was encouraging. More importantly, respondents in both regional Federal Reserve surveys remained upbeat about the next six months. Looking abroad, Europe, which had been one of the bright spots in recent months, also experienced softness. The IHS Markit Flash Eurozone Manufacturing PMI declined for the fourth straight month, down from 56.6 in March to 56.0 in April, the weakest reading since February 2017. Overall, stronger economic growth and continued tightening in the labor market have helped to push up wages and benefits, as one might expect. Private manufacturing compensation rose 0.7 percent in the first quarter, or 2.9 percent over the past 12 months. It was the fastest year-over-year pace of growth in manufacturing compensation since the second quarter of 2011, and to put that figure in perspective, the year-over-year rate registered 2.2 percent in the first quarter of 2017. Breaking that down further, private manufacturing wages and salaries also rose 0.7 percent in the first quarter, with benefits jumping 0.8 percent. Private-sector manufacturing workers earned 2.6 percent more over the past 12 months in wages and salaries, with benefit costs up 3.3 percent year-over-year. Despite this, consumer confidence data showed mixed results in the latest releases. The Conference Board reported that the Consumer Confidence Index edged higher in April, up to 128.7, after pulling back slightly in March from February’s 18-year high (130.0). In general, Americans remain upbeat about the economy, with the index continuing to be at elevated levels. Yet, many of the underlying survey questions softened in April, including those about the strength of the economy and regarding labor market and income expectations. Meanwhile, the Index of Consumer Sentiment from the University of Michigan and Thomson Reuters dropped from 101.4 in March—the highest level since January 2004—to 98.8 in April. The press release cites policy uncertainties as a concern for many respondents, especially regarding trade policy. Despite the easing in April’s headline index, Americans continue to be more optimistic over the long term, and these figures are largely consistent with 2.7 percent growth in consumer spending over the next 12 months. Updates coming out this week include the latest Institute for Supply Management’s Manufacturing PMI report and job growth figures for April. There will also be a new manufacturing survey from the Dallas Federal Reserve Bank, and the Census Bureau will release data on factory orders and shipments. On the hiring front, manufacturers have added an average of 27,167 workers per month over the past six months, and the expectation is for healthy job gains in April as well. Indeed, the labor market remains tight, with workforce recruitment and retention a top challenge for business leaders nationally. The Federal Open Market Committee will meet May 1–2. After raising short-term rates at the conclusion of its March meeting, participants are not expected to make any changes to monetary policy this week. Instead, the consensus is for another rate hike at the June 12–13 meeting. Other highlights this week include new data on construction spending, international trade, labor productivity and personal income and spending. The Chicago Federal Reserve Bank reported that the U.S. economy “moderated” in its economic growth in March after the robust gains in February. The National Activity Index (NAI) pulled back from 0.98 in February—the best reading since February 1999—to 0.10 in March. The three-month moving average, which helps to smooth out month-to-month volatility in the data, also eased, down from 0.31 in February to 0.27 in March. Overall, the NAI continues to be encouraging, as positive readings indicate growth above the historical trend. Manufacturing continued to make a positive contribution to the NAI, even as output decelerated from the strong data in the prior month. Manufacturing production inched up 0.1 percent in March, building on the solid 1.5 percent increase in February, with output in the sector up 3.0 percent over the past 12 months. That was the fastest year-over-year pace of growth for the sector since June 2012. As a result, production-related indicators added 0.14 to the NAI in March, down from a solid 0.54 in February. In contrast, employment-related indicators subtracted 0.07 from the headline index, with nonfarm payroll growth slowing. Yet, manufacturers added 22,000 workers in March, extending the 32,000 gain in employment in February. It was the sixth consecutive month with robust hiring growth in the sector, averaging 27,167 per month over that time frame. The Conference Board reported that consumer sentiment edged higher in April after pulling back slightly in March from February’s 18-year high (130.0). The Consumer Confidence Index rose from 127.0 in March to 128.7 in April. In general, Americans remain upbeat about the economy, with the index continuing to be at elevated levels. In April, respondents felt somewhat more optimistic about both current (up from 158.1 to 159.6) and future (up from 106.2 to 108.1) economic conditions. Yet, many of the underlying survey questions softened in April. For instance, the percentage of respondents saying that business conditions were “good” eased from 37.6 percent to 35.2 percent, but the percentage suggesting that conditions were “bad” also declined, down from 13.3 percent to 11.3 percent. The data on labor market and income expectations also showed mixed results, while remaining positive overall. The percentage of respondents feeling jobs were “plentiful” decreased from 39.5 percent to 38.1 percent, with those saying jobs were “hard to get” inching down from 15.7 percent to 15.2 percent. At the same time, the percentage expecting their income to increase decreased slightly from 23.2 percent to 23.1 percent, with those predicting reduced income dropping from 7.2 percent to 6.8 percent. The Census Bureau reported that new durable goods orders rose for the second straight month, up 2.6 percent in March and extending the 3.5 percent gain in February. New durable goods orders jumped from $248.6 billion in February to $254.9 billion in March, a new all-time high. With that said, much of the increase in both months came from nondefense aircraft and parts orders, which can have large monthly swings. Indeed, new orders for durable goods with transportation equipment excluded were unchanged in March. New durable goods orders have trended strongly higher across the past 12 months, soaring 9.5 percent since March 2017, or 6.7 percent year-over-year with transportation equipment excluded. One of the more important measures in this release is new orders for core capital goods (or nondefense capital goods excluding aircraft), which can often be a proxy for capital spending in the U.S. economy. In March, new orders for core capital goods edged down 0.1 percent, but like the headline number above, the year-over-year pace registered a very healthy 7.0 percent. Looking more closely at the various durable goods sectors in March, the data showed mixed results. In addition to nondefense aircraft and parts, sales rose for primary metals (up 1.4 percent), computers and electronic products (up 1.3 percent), fabricated metal products (up 0.1 percent) and motor vehicles and parts (up 0.1 percent). In contrast, orders declined for machinery (down 1.7 percent) and other durable goods (down 0.4 percent). Meanwhile, durable goods shipments increased 0.3 percent in March, or excluding transportation, shipments fell 0.4 percent. Much like the new orders data described above, shipments have trended convincingly higher over the past year. Since March 2017, durable goods shipments have risen at solid rates—up 7.0 percent—with year-over-year growth of 6.7 percent when excluding transportation equipment. In addition, shipments of core capital goods have also improved mightily over the past 12 months, up 7.5 percent year-over-year despite declining 0.7 percent in March. The Bureau of Labor Statistics reported that private manufacturing compensation rose 0.7 percent in the first quarter, up from a gain of 0.5 percent in the fourth quarter. On a year-over-year basis, compensation in the sector grew 2.9 percent. It was the fastest year-over-year pace of growth in manufacturing compensation since the second quarter of 2011, and to put that figure in perspective, the year-over-year rate registered 2.2 percent in the first quarter of 2017. Overall, the appreciation in overall compensation over the past year has been consistent with recent tightness in the labor market. Indeed, private manufacturing wages and salaries also rose 0.7 percent in the first quarter, with benefits jumping 0.8 percent. Private-sector manufacturing workers earned 2.6 percent more over the past 12 months in wages and salaries, with benefit costs up 3.3 percent year-over-year. Overall, the employment cost index for private-sector workers increased 1.0 percent in the first quarter, picking up from 0.5 percent in the fourth quarter. Private-sector wages and salaries and benefits both rose 1.0 percent in this report. Over the past 12 months, total compensation for private-sector workers increased 2.8 percent, with wages and salaries and benefits up 2.9 percent and 2.6 percent, respectively. The National Association of Realtors (NAR) reported that existing home sales rose 1.1 percent in March, extending the 3.0 percent gain in February. Sales of existing homes increased from 5.54 million units at the annual rate in February to 5.60 million units in March. It was the fastest pace since November’s rate (5.72 million units), which was the fastest since February 2007. Despite the increase in the latest data, existing home sales have slipped 1.2 percent over the past 12 months, down from 5.67 million units one year ago. NAR Chief Economist Lawrence Yun attributed the weaker year-over-year data to low inventories and increased prices. Along those lines, the median existing home sales price was $250,400 in March, up 5.8 percent over the past 12 months. In March, existing home sales rates increased for both single-family (up from 4.96 million to 4.99 million) and condominium and co-op (up from 580,000 to 610,000) units. Sales increased in the Midwest and Northeast, but decreased in the South and West. Meanwhile, there were 3.6 months of supply for existing homes, up slightly from 3.4 months in February but down from 3.8 months one year ago. The Bureau of Economic Analysis reported that the U.S. economy grew by an annualized 2.3 percent in the first quarter, according to preliminary data. This was slightly better than the consensus estimate of around 2 percent, even as real GDP eased from 2.9 percent growth in the fourth quarter data. In addition, this was the strongest first quarter reading in three years. 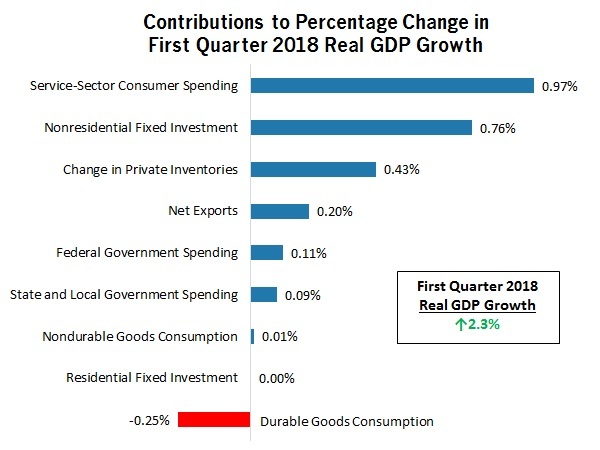 Overall, the latest report found healthy growth in nonresidential fixed investment and service-sector spending, with inventory spending and net exports rebounding in the first quarter after being notable drags in the prior release. At the same time, goods spending and the housing market were sluggish, with durable goods spending pulled lower by weak motor vehicle and parts demand. Since the end of the Great Recession, the U.S. economy has expanded 2.2 percent on average, with 2.3 percent growth in 2017. Moving forward, real GDP should grow by roughly 3 percent in 2018, which would be the strongest growth rate since 2005. Passage of tax reform and other pro-growth measures should help to stimulate economic activity, allowing us to reach that goal. Along those lines, manufacturers continue to increase capital spending, investment and wages because of tax reform and the changed regulatory environment, and the NAM has highlighted those stories on its “Keeping Our Promise” web page. In my testimony before the Joint Economic Committee earlier this month, I said that tax reform should lead to $55 billion in additional fixed investment in manufacturing this year, with the sector adding at least 100,000 more workers. These data were mostly consistent with that optimism, as business spending was one of the larger bright spots in the first quarter GDP data. Nonresidential fixed investment rose 6.1 percent at the annual rate in the first quarter, extending the 6.8 percent gain in the fourth quarter. Businesses spent more on structures, up by an annualized 12.3 percent and the best reading in one year, with relatively solid growth for both equipment (up 4.7 percent) and intellectual property products (up 3.6 percent). Nonresidential fixed investment contributed 0.76 percentage points to top-line growth, with positive spending on inventories adding another 0.43 percentage points. On the international front, net exports swung back to be a positive contributor in the first quarter, adding 0.20 percentage points, after subtracting 1.16 percentage points from GDP in the fourth quarter. Goods exports increased 6.1 percent in the first quarter, which was more than enough to offset the 2.1 percent rise in goods imports. In contrast to those measures, consumer spending was a weak spot and something that it is hoped will turn around in both revisions and upcoming quarters. Goods spending declined 1.1 percent at the annual rate in the first quarter, pulling back from the 7.8 percent gain in the fourth quarter (the strongest quarterly gain in nearly 12 years). Indeed, this mirrors other data, which have found Americans more skittish about spending in the early months of 2018 in the aftermath of more robust purchasing at year’s end. Indeed, durable goods spending fell by an annualized 3.3 percent in the first quarter, with nondurable goods demand up just 0.1 percent. As a result, goods spending subtracted 0.24 percentage points from real GDP growth for the quarter. Service-sector spending, on the other hand, rose modestly, up 2.1 percent, adding 0.97 percentage points to headline growth. Americans spent more on financial services and insurance and health care, for instance. The IHS Markit Flash U.S. Manufacturing PMI rose from 55.6 in March to 56.5 in April, the strongest expansion pace since September 2014. New orders (up from 56.4 to 58.6), output (up from 55.2 to 56.4) and exports (up from 51.0 to 51.1) all rose in April, with demand growth at a three-year high. Measures for hiring (down from 54.7 to 54.0) and future output (down from 74.0 to 73.9) decelerated slightly in the latest survey, while remaining encouraging overall. On the downside, raw material prices picked up in April (up from 63.6 to 67.3), with input costs expanding at rates not seen since June 2011. Meanwhile, manufacturing activity in Europe slowed to a 14-month low despite continuing to show signs of modest growth overall. The IHS Markit Flash Eurozone Manufacturing PMI declined for the fourth straight month, down from 56.6 in March to 56.0 in April, the weakest reading since February 2017. The underlying data also slowed in their growth rates, including new orders (down from 55.5 to 54.3), output (down from 55.9 to 55.8), exports (down from 54.8 to 53.7) and employment (down from 56.2 to 55.6). Manufacturers in Europe remain mostly upbeat about production over the next six months, even with some additional easing in the index of future output (down from 64.9 to 64.2). Input costs also remained elevated despite slowing in April (down from 65.6 to 63.4). In addition to data on Europe as a whole, IHS Markit also released figures for France (down from 53.7 to 53.4) and Germany (down from 58.2 to 58.1), both of which had modest expansions but with softening demand and output growth. Final data on each of these surveys will be released May 1. The Census Bureau released advance statistics on international trade in goods. Specifically, the goods trade deficit fell 10.3 percent, down from $75.88 billion in February to $68.04 billion in March. The sharp decline stemmed from a jump in goods exports (up from $136.67 billion to $140.09 billion) that corresponded with a significant decrease in goods imports (down from $212.55 billion to $208.12 billion). Final data will be released May 3. Note that a surplus in service-sector activity, which registered $19.42 billion in February, helped to improve the overall U.S. trade deficit. In March, goods exports mostly increased, including capital goods (up $1.84 billion), foods, feeds and beverages (up $914 million), industrial supplies (up $682 million), other goods (up $590 million) and consumer goods (up $250 million). However, exports of automotive vehicles decreased $862 million. Meanwhile, goods imports fell steeply, led by decreases for capital goods (down $1.77 billion), consumer goods (down $1.28 billion), industrial supplies (down $900 million) and foods, feeds and beverages (down $478 million). The Kansas City Federal Reserve Bank reported that manufacturing activity expanded in April at the fastest monthly pace since the survey was created in July 2001. The composite index of general business conditions accelerated from 17 in March to 26 in April, with very robust growth in several key measures, including new orders (up from -1 to 37), production (up from 20 to 33) and shipments (up from 12 to 37). Employment (unchanged at 26) remained one of the bright spots in the latest survey, with the index still at the all-time high reading notched in the prior release. Still, the average workweek slowed a little (down from 15 to 10)—while continuing to increase modestly—and exports (unchanged at 1) were softer than desired. The index for prices paid for raw materials pulled back a little from the nearly seven-year high recorded in March (down from 55 to 52), but input costs remained highly elevated overall. Fifty-eight percent of manufacturing leaders responding to the survey said their raw material costs increased in April, with just 5 percent noting reductions and 38 percent suggesting no changes. Moreover, cost pressures are expected to remain strong moving forward, albeit with some easing in this survey. The forward-looking index for input costs (down from 72 to 66) decelerated for the second straight month from February’s seven-year high, but 69 percent of respondents still said they see raw material prices rising over the next six months, with 5 percent predicting declines for their firm. Meanwhile, manufacturers remained upbeat about the next six months, even with some easing in April’s survey. The future-oriented composite index pulled back from February’s all-time high reading of 38 to 33 in March and 31 in April. More than half of respondents anticipate higher new orders, production and shipments in the coming months, with 44 percent and 43 percent seeing more employment and capital spending, respectively. The Census Bureau and the Department of Housing and Urban Development reported that new home sales rose 4.0 percent in March, extending the 3.6 percent gain in February. New single-family residential sales increased from 667,000 units at the annual rate in February to 694,000 units in March. This was the best reading since November’s pace of 711,000 units, which was the fastest since October 2007. In March, the largest gains occurred in the West, with the steepest drop in the Northeast, mainly due to poor weather conditions. On a year-over-year basis, new single-family home sales increased 8.8 percent, up from 638,000 units in March 2017. Meanwhile, inventories of new homes for sale dropped from 5.4 months to 5.2 months of supply, the lowest level since November (4.8 months). With fewer new homes for sale, median sales prices have risen 4.8 percent over the past 12 months, up from $321,700 one year ago to $337,200 in March. The Richmond Federal Reserve Bank reported that manufacturing activity in its district contracted in April for the first time since September 2016. The composite index for general business assessment dropped from 15 in March to -3 in April. Many of the key measures also weakened in the latest survey, including new orders (down from 17 to -9), shipments (down from 15 to -8) and capacity utilization (down from 13 to -4). With that said, manufacturers in the region continued to invest in their businesses, which should be interpreted as a sign of confidence moving forward. Along those lines, faster growth in April occurred for employment (up from 11 to 12), wages (up from 22 to 27) and capital expenditures (up from 16 to 31). Indeed, the capital spending index reached its highest point since the question was added in December 2010, which was encouraging. Manufacturing respondents remained mostly upbeat about the next six months, even with some easing in April in their outlook. Forward-looking measures for new orders (down from 46 to 36), shipments (down from 55 to 39), capacity utilization (down from 40 to 25), capital expenditures (down from 39 to 30) and the average workweek (down from 18 to 10) remained at very healthy levels despite some softening in this survey. At the same time, manufacturing leaders expect the labor market to remain tight, with accelerating paces for both hiring (up from 31 to 34—an all-time high since the question was added in May 1997) and wages (up from 42 to 47—the best reading since October 2004). Meanwhile, manufacturers in the district continue to note accelerating pricing pressures, mirroring data in other reports. Respondents said that prices paid for raw materials increased 2.43 percent at the annual rate in April—a 13-month high—up from 2.39 percent in March. Moreover, raw material prices are expected to grow 2.52 percent at the annual rate six months from now, slowing slightly from 2.59 percent in the prior survey. The University of Michigan and Thomson Reuters reported that consumer confidence pulled back in April from March’s 14-year high, largely on recent volatility in equity markets and the impact that has on personal finances. The Index of Consumer Sentiment dropped from 101.4 in March—the highest level since January 2004—to 98.8 in April. However, that was better than the preliminary figure of 97.8. The press release cites policy uncertainties as a concern for many respondents, especially regarding trade policy. Despite the easing in April’s headline index, Americans continue to be more optimistic over the long term. In April, consumer sentiment softened in perceptions of both current (down from 121.2 to 114.9) and future (down from 88.8 to 88.4) economic conditions. The current economic conditions index registered an all-time high in March, with April’s reading representing a deceleration from that point. Even with the weaker April data, these figures are consistent with 2.7 percent growth in consumer spending over the next 12 months.